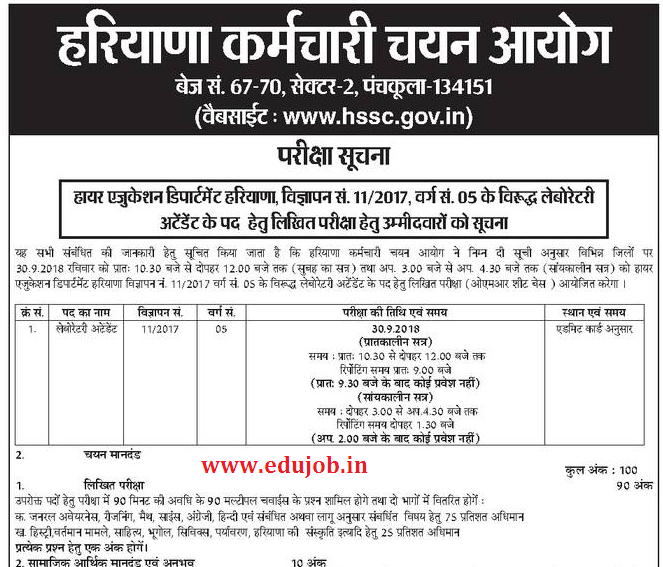 Haryana Staff Selection Commission HSSC Lab Attendant Syllabus, Exam Pattern, Study Materials in the PPDF format has been provided in this article. Candidates can also download HSSC Lab Attendant Syllabus PDF from this article. Aspirants who want to work as Lab Attendant, he/she has to immediately start preparation after getting the Syllabus for HSCC Lab Attendants. Speed up your preparation and finally crack the exam by keeping one thought in mind that this time no body / obstacle can stop you. There is no Negative marking in exam. Here, candidates will get the HSCC Lab Attendant syllabus 2018-19 with each topic explanation. HSSC Lab Attendant exam will be held on 30th Sep 2018. HSSC Laboratory Attendant exam pattern consists of two sections – (a) written Test and (b) Socio-Economic Criteria & Experience. Total time for both section will be 120 minutes i.e. 2 hrs. Written examination can be either on OMR Sheet based or online computer based test (CBT). There will be no negative marking. Each question will carry 1 mark. HSSC Lab Attendant Exam will be conducted in two shifts only – morning and evening. Total number of vacancy for HSSC Lab Attendant is 162. Candidates can also view or download the HSCC Lab Attendant Official notification pdf by clicking on below link. Candidates can download HSCC Lab Attendant & Other recruitment Study Materials and previous year question papers by clicking on below links. Candidates can buy the HSSC Recruitment Books PDF from Amazon website by clicking on below link. There are below document need to carry for HSSC Lab Attendant document verification after clearing the written exam. Declaration by the Unemployed (for claiming exam fees). What is work of HSSC Lab Attendant. If candidates have an interest for working in laboratory – science, medical clinics, environmental industries, government projects, food and beverage companies. (a) In hospital and medical clinics, lab attendants collects and analyse specimen data used to treat and diagnose medical diseases and conditions. (b) In Pharmaceutical lab, lab assistants assist with the coordination of experiments and leading to the technical development of new treatments and drugs. (c) In food and beverage companies, test the quality of food and beverage. (d) In environmental and civil service lab, lab attendants test the samples for researching that may cause harm to humans, animals and environments. Haryana HSSC Lab Attendants salary or pay scale is also very good which is given below in a tabulated form with other job profile.